We have new, used and consignment guns in stock for hunting and personal defense. Stop by regularly to see the newest additions to our lineup. Due to the overwhelming amount of repairs and sales, I am not accepting any new repair work at the moment. Please feel free to contact me to discuss future repair work. Installation of new equipment like optics and accessories for recent purchases is always available. We are fully stocked with a wide range of long rifle, shotgun and handgun loads. If you have a hard to find load or brand requirement, just call ahead to make sure it's available when you stop in. We order weekly so just let us know what you need. We have a range of rifles, shotguns and handguns available daily. We are FLL certified and can also order specific firearms if you're looking for something special. Left-hand load, junior hunter stock lengths and more are available by order. Check for price and availability. Sometimes a used firearm is the right tool for the job. A "brush gun" for the hunter on the move in rough country or a starter gun for a new shooter is often the perfect time to consider a used firearm. Stop by to see what we have available from clients who have traded up and left their quality used guns available for purchase. If you have a firearm that you would like to see sold in a professional manner for a better return on your investment, call us to make an appointment to discuss the value of your firearm and learn what we can do for you. We carry a full range of Optics for every budget. Nikon, Leupold and more are available from the enthusiast to the competitive shooter. Bore sighting available. Get your cleaning, storage and field supplies to keep your firearm in immaculate working order and ensure it's long life. 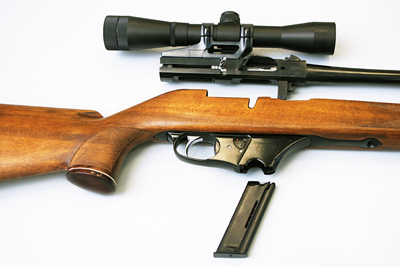 A firearm is only as good as the care it's given and we have the right equipment to keep yours in optimal condition. © 2017 Bryant Firearms Repair, LLC. All Rights Reserved.